It’s no secret I’ve been an rtorrent fan for nearly a decade now. It has its shortcomings and at times it seems to lack some features that the new kids have. But overall, it has been a reliable standby. That doesn’t mean it’s the best way of doing things though, and when you stop trying new things, that’s when you get old. But gtorrent-ncurses — the text-only option to the full gtorrent — might not be the one to take the throne. It looks like a good start, and as best I can tell it is actually working. But that interface looks suspiciously broken, and as best I can tell, there are only two controls: “a” for add a torrent, and “q” for quit. No progress indicator. No bandwidth meters. No throttling controls. No help screens, priority settings, peer lists, sharing ratios, tab completion for adding files … the list goes on. I only looked briefly at gtorrent’s full graphical interface, so it may be that it’s possible to get those things from the full X-based UI. They are suspiciously missing from the text-only version though, and in this day and age, more than a dozen years after the original BitTorrent, it’s a little hard to overlook. This entry was posted in Linux and tagged client, download, manager, torrent on 2014/09/16 by K.Mandla. I have to remind myself that today’s first treasure is just a tool, and a tool is just a tool. What you do with these things is none of my business. pirate-get, as you might infer, performs a search of the world’s most infamous bittorrent tracker, and returns the results in the console. I could leave it at that, and allow you to glean from that what you will, but there are a couple of things that pirate-get does that are worth pointing out. And not for any reasons except that it does those things well. First, as you can see above, pirate-get by default returns results in descending number of seeds. I really, really like that, because searching for — ahem — Linux ISOs is not just a matter of what best matches my search terms, but what matches and is available. Perhaps you can sympathize. For those who don’t, pirate-get can accept a --custom flag, and pass the link to another program. I tested it with pirate-get Ubuntu --custom "deluge %s" and it gracefully handed off the magnet link to a running session of Deluge, no questions asked. Which brings up an important point: By default, pirate-get returns the text of the magnet link to your $BROWSER, and I don’t see an option to download the actual torrent unless you somehow pipe that link through another site or utility that will convert it. If I don’t include the custom command with pirate-get, my selection is dumped into elinks, which only shows an error message. So keep that in mind if you prefer to work with the actual torrent (some people do; I know, it’s old-fashioned) you might need to do a little jerry-rigging to get it going to your satisfaction. I like pirate-get a lot, mostly for the things I’ve mentioned above, but also because it can do things like return “all” the results at once, or spit out the torrents added in the last 48 hours. It’ll also show descriptions and file lists, which can be helpful if you’re skimming through a list of distros and aren’t sure what’s what. One last note: There’s a --color flag available, and what you see in the screenshot — basically alternated bolding — is the result. Personally that doesn’t really qualify as “color” in my mind, but I’m willing to overlook it. If you want to get that effect, you’ll need to install python2-colorama, for the Arch version at least. This entry was posted in Linux and tagged client, download, search, torrent on 2014/08/08 by K.Mandla. I should have a separate category for CLI utilities of graphical programs. Inkscape would be on there. So would deluge, avidemux, handbrake and a bunch of other titles. You can add Transmission to the list now. 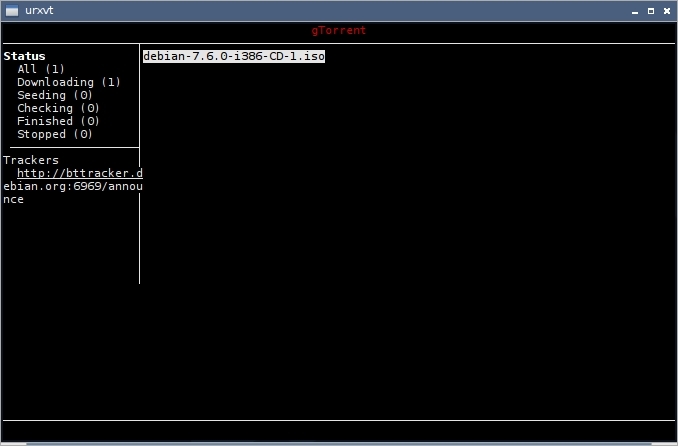 The CLI version appears in both Arch and Debian as “transmission-cli,” which I suppose is the obvious title for it, given how it appears on screen. Use is fairly straightforward — trigger transmission-cli and follow it with a torrent name. Bandwidth settings and a few other points are controlled as flags. On-screen, you get a healthy log of the network and software transactions, as well as a progress indicator and speed meters. The Arch package specifically installs with a daemon version and a few other related tools, including a torrent creator utility. That alone might be worth keeping track of. I should mention as a side point that transmission-cli appears to be different from transmission-remote-cli, which should be a tool for accessing a machine that’s running Transmission, from a distance. I’m not sure what the relationship is between the two; it’s a little confusing to me that the home page for Transmission links to transmission-remote-cli, but I don’t see a mention of just transmission-cli. I’m also not sure transmission-remote-cli can negotiate with transmission-cli. You’ll have to do the footwork there. 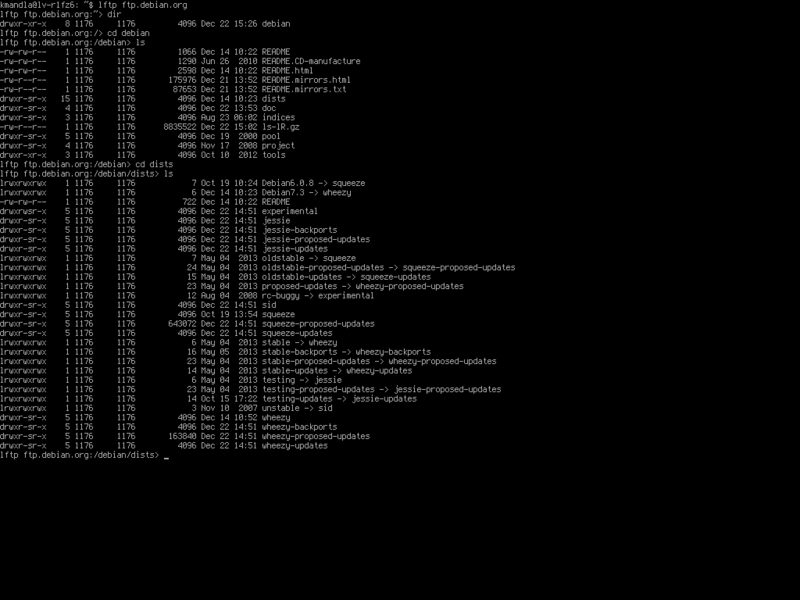 I should probably try out transmission-remote-cli though, because the screenshots on the git page look promising. I think the actual arrangement of the remote machine running Transmission might make it a challenge though. I’ll save that for another day. 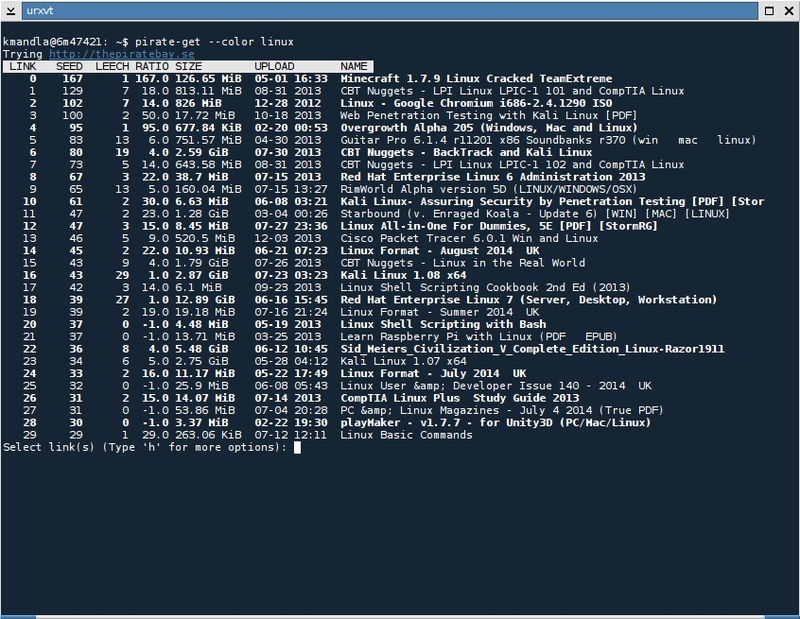 This entry was posted in Linux and tagged client, torrent on 2014/06/08 by K.Mandla. I think you can probably infer what torrentinfo from its name. Here’s what it looks like in action. As you can see, torrentinfo not only decodes the otherwise indecipherable mess in most torrent files, but breaks it down into easily readable chunks, color-coded and neatly spaced. Very nice. I noticed that torrentinfo can handle a string of torrents, but any flags you want to use have to be listed at the front. Putting -b at the end, for example, caused torrentinfo to spit out errors. This entry was posted in Linux and tagged information, torrent on 2014/06/06 by K.Mandla. Since I’m on to tools that everyone knows and are quite popular, I might as well throw rtorrent into the mix. By most accounts it’s the program that I had no real part in developing, but seemed to bring me a lot of attention. It’s hardly fair, and I should probably apologize for riding its coattails. But the strange part is, nearly a decade later, it’s still the smartest, leanest, sharpest torrent client for the console there is, and rivals a lot of graphical ones too. This entry was posted in Linux and tagged client, download, manager, torrent on 2014/04/12 by K.Mandla. 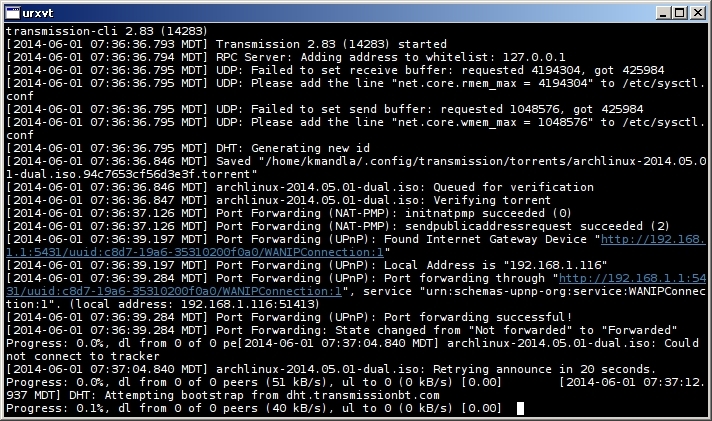 A long time ago, tools like mktorrent were the “in” thing. They were the “in” thing, before every torrent client and its grandmother offered to make torrent metainfo files for you, register them with a tracker, upload them, make coffee for you and do your laundry. On the other hand, mktorrent still works (no, I didn’t try it this time, but I did use it last year), and it is a console-only solution to what has otherwise fallen to graphical programs to handle. This entry was posted in Linux and tagged make, metadata, metainfo, torrent on 2014/01/11 by K.Mandla. Of course the answer to that is “no,” and I know that now, but it does amuse me to think that I assumed anything FTP would happen in a terminal emulator in Linux. lftp has its origins way back in 1996, can handle any number of protocols including direct server-to-server, and can run on machines as lowly as 486s, if the supporting OS is there, I presume. Blah blah blah. Tell me about the torrent client! That’s right, don’t let your system administrator find out, but lftp can handle torrent traffic too. It’s fairly simple and doesn’t nearly have the frills that some others do, but you can kill two birds with one stone now. My only fear is that this will usher in an age of lftp becoming a jack-of-all-download tools, and I prefer applications find their focus and concentrate on it. This entry was posted in Linux and tagged client, download, ftp, manager, torrent on 2013/12/23 by K.Mandla.